Our Online Store is currently undergoing upgrades and changes. Please give us a call with any questions or orders at (847) 251-2272. Kalamazoo Outdoor Gourmet grills, outdoor lifestyle products, and custom outdoor gourmet kitchens deliver superior design, performance and quality, bringing people together for a lifetime of outdoor gourmet entertaining. "The relationship between man and fire stands as the single most important evolutionary jump ever introduced to the human species. We engage modern human existence and our need as humans to embrace fire into our designs, balancing the need for beauty, function, durability, and value into every grill we manufacture. "Geoffrey Bullard"
For more informaiton about Kalamazoo Outdoor Gourmet or to order contact a BackYard Barbecue Grill Specialist today! In 1998, while digging through an old steel filing cabinet, Geoffrey Bullard found his great grandfather Lewis Bullard`s original plans for a grill built in 1906 for W.E. Upjohn. At the time Geoffrey was running KSM, his great grandfather`s business otherwise known as Kalamazoo Sheet Metal. It was at that moment the modern Kalamazoo Outdoor Gourmet grill was born, but its roots are in the sheet metal division of Acme Hardware in Kalamazoo, Michigan, which was incorporated by Lewis Bullard in 1906 as Kalamazoo Sheet Metal. Kalamazoo Sheet Metal manufactured many of Lewis Bullard`s inventions, including one of the first slot machines, The Mighty Kalamazoo, and the first folding daybed. Kalamazoo Sheet Metal`s greatest success was in manufacturing some of the first compression machines for making pills for Upjohn. And, of course, Kalamazoo Sheet Metal created original gourmet grills for W.E. Upjohn and many other locals. Geoffrey Bullard followed the inspiration he uncovered from his great grandfather in 1998, and today he is the chief designer of Kalamazoo Outdoor Gourmet grills. Like his great grandfather, Geoffrey takes a unique approach to his designs. 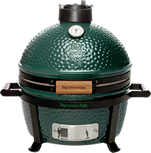 Kalamazoo Outdoor Gourmet grills offer many unique innovations: the Kalamazoo Outdoor Gourmet original Dragon Burner? 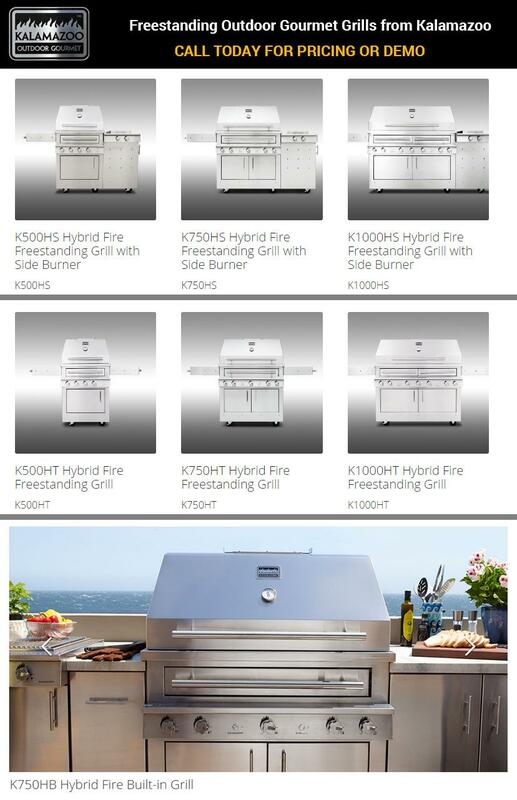 ; the side-mounted smoker box; the gourmet Dual-Fuel Grilling Drawers system; the deep hopper that reduces flare-ups and increases heat; and the fully-framed design that creates a superior structure that will never wobble or fail. Kalamazoo Outdoor Gourmet also pioneered the use of infrared gas burners. Kalamazoo Outdoor Gourmet grills are hand-built of heavy-gauge grade 304 stainless steel using advanced laser-cutting and bending techniques, quality TIG welding and hand grinding and polishing. Our products are designed and built like no others, and offer an outdoor gourmet grilling experience to last a lifetime. 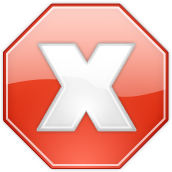 The history and features of our products have garnered the attention of numerous publications, including Time Magazine, The Wall Street Journal, and The New York Times. The Kalamazoo Outdoor Gourmet Custom Outdoor Gourmet Kitchens are featured regularly on the Travel Channel, and National Product Review has referred to our grills as "the Hummer of grills."